Each Barbie® Fashionistas™ doll has her own look and style -- from casually cool to boho bold, all fashions are inspired by the latest trends, and with two additional complete outfits the styling fun is endless! With added diversity and more variety in styles, fashions, shoes, and accessories, kids everywhere will have infinitely more ways to spark their imaginations and play out their stories. Includes Barbie® Fashionistas™ doll wearing fashion and shoes, two additional complete looks (a dress and/or top and bottom), a second pair of shoes, two purses, and one accessory. Each sold separately, subject to availability. Dolls cannot stand alone. 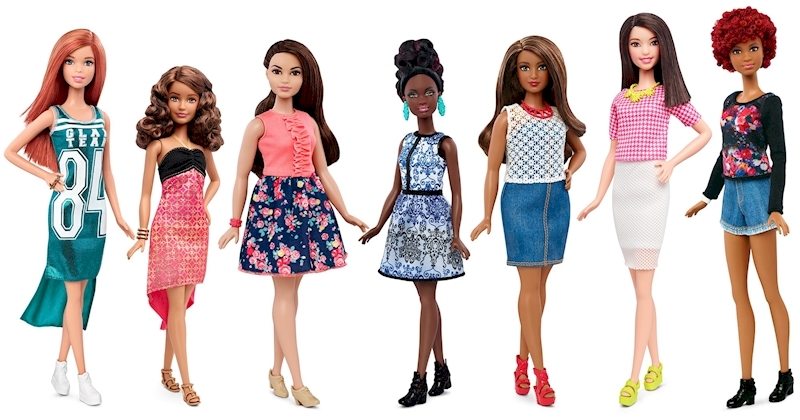 Clothing is designed to mix and match with dolls of the same body type; select pieces can be shared across the line. Flat shoes fit dolls with articulated ankles or flat feet. Colors and decorations may vary. Features: Barbie® Fashionistas™ doll includes a fabulous outfit and comes with two additional complete looks to mix and match for endless fun! The fashions feature a trendy dress and/or top and bottom combination inspired by the latest trends with popular colors, fun fabrics and graphic prints. Two pairs of shoes complement all of the looks. Two trendy purses allow for different fashion statements. And a fabulous accessory, like a piece of gorgeous jewelry, fabulous hat, or cool glasses, adds a glam finishing touch. Find your style and play out your stories! More variety makes collecting Barbie® Fashionistas™ dolls even more fun. Collect them all (each sold separately, subject to availability).